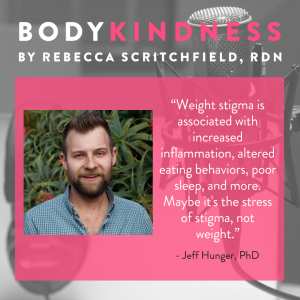 In the first of a short series looking at research and weight stigma, I talk to Dr Jeffery Hunger, a postdoctoral scholar in Health Psychology at UCLA. As a social and health psychologist, Dr. Hunger is interested in using insights from psychology to understand and ultimately improve the health of stigmatized groups (e.g., heavier individuals, racial and sexual minorities). We have a great conversation about how stigma impacts mental and physical health and why stigmatizing weight should never be used as a health promotion tool. We also talk about the need for research on weight stigma/body image and health to be more intersectional. Jeffery Hunger is a postdoctoral scholar in Health Psychology at UCLA. He received his bachelor’s degree in psychology from the University of Minnesota, master’s degree in psychological research from CSU Fullerton, and PhD in Psychological and Brain Sciences from UC Santa Barbara. As a social and health psychologist, Dr. Hunger is interested in using insights from psychology to understand and ultimately improve the health of stigmatized groups (e.g., heavier individuals, racial and sexual minorities). Dr. Hunger’s research is published in top outlets across psychology, public health, and medicine, and has been featured in the New York Times, Huffington Post, NPR, and more. Hunger, J.M., & Tomiyama, A.J. (2018). Weight labeling and disordered eating among adolescent females: Evidence from the NHLBI Growth and Health Study. Journal of Adolescent Health. Hunger, J.M., Blodorn, A., Major, B., & Miller, C. (2018). The psychological and physiological effects of interacting with an anti-fat peer. Body Image.